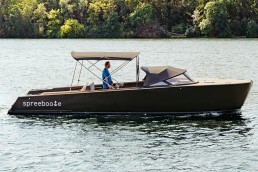 For the new season 2019 we have COCO, a new boat with bow thruster and no licence required. The 2019 season runs from Good Friday, 19 April to 27 October. So make sure you get the best dates and book online! By the way: We provide life jackets free of charge on site – for children and adults. 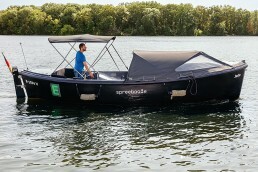 Video-Tutorial “Briefing on our boats”: Here you can see how easy our Spreeboote can be driven. 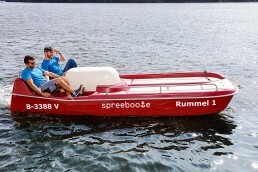 The Rummel is a XL-Pedalo. It can accommodate up to 5 people. How can I reduce my deductible in the event of a claim?We have taken out a comprehensive insurance for all boats with a deductible of 2000,-€. If you wish, you can reduce this excess to 300,-€ at the time of booking, for which 5% of the net rental price will be charged. We keep our boats in perfect condition. Should there be a defect, it will be shown on delivery and documented in the rental contract. For foreign damages caused by the tenant, we have of course taken out a liability insurance, the costs of which are included in the rental price.